‘In the end we all succumb to the pull of the molten core’ (2016) by Glenn Brown, installed at the Laing Art Gallery. Photography by Jack Cornish, image courtesy of Laing Art Gallery. 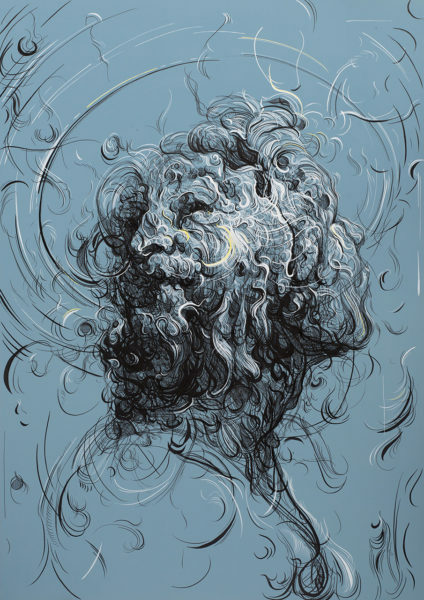 The internationally acclaimed artist Glenn Brown has produced a major new work, specifically for the Laing Art Gallery in Newcastle, making it the first donation made through the Contemporary Art Society’s Great Works scheme. ‘In the end we all succumb to the pull of the molten core’ (2016) shows the turning heads of two men – one young and one old – laid on top of each other, seeming to split in opposite directions. Drawn in Indian ink and painted with acrylic on panel, these two portraits, appropriated from images by Giovanni Domenico Tiepolo and Andrea del Sarto, merge into one in a writhing swirl of fast lines and swiftly marked gesture. 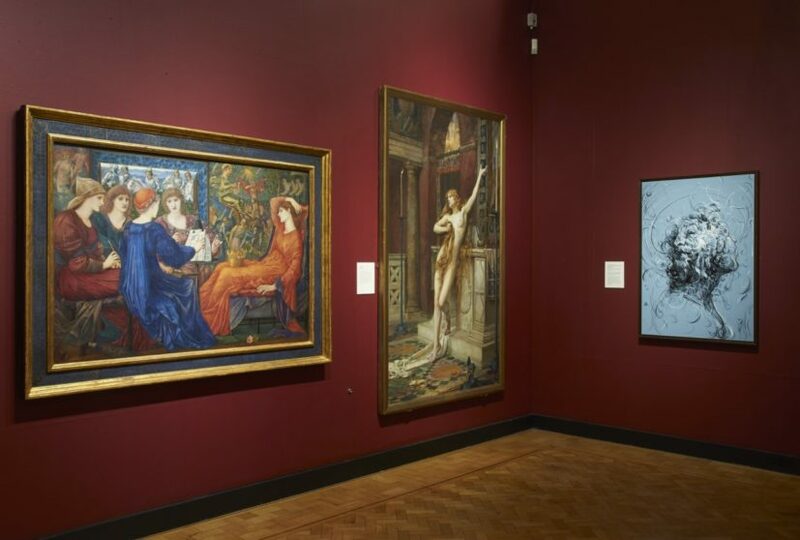 The Great Works scheme, generously supported by the Sfumato Foundation, aims to tackle the absence in UK museums of works by major British artists over the last 20 years. 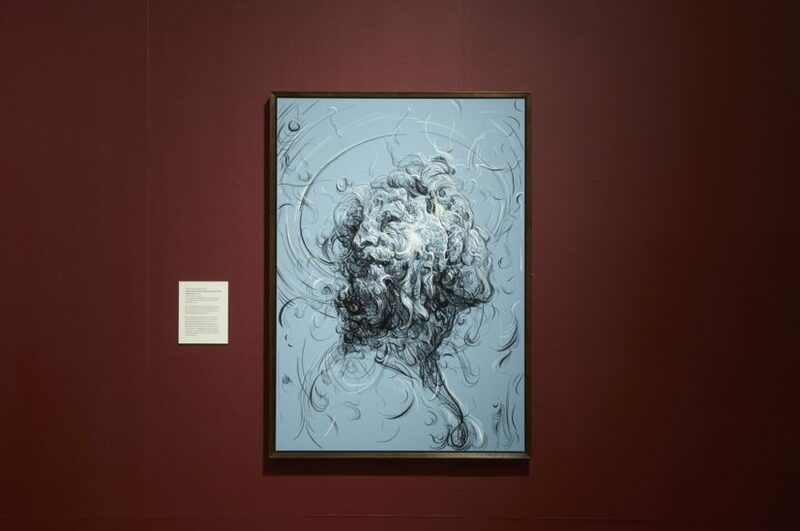 This will be the first piece by Glenn Brown placed in a UK museum collection and the Laing Art Gallery is significant to the artist having first visited as a child growing up in Hexham, some twenty miles from Newcastle. 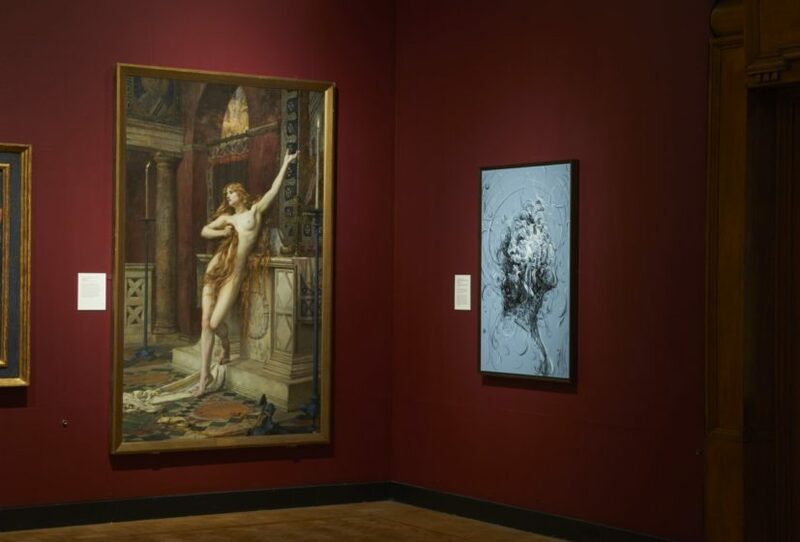 Glenn Brown: “The Laing Art Gallery is a very special place, not just because it was there that I first encountered art, but because now, 45 years after I first went through its doors, it is even more full of great art. To me, as a painter, it is the North East England’s most important building and collection of art. Museums are vital to the future of any city, as culture can only move forward if it knows where it has been, if it understands its history. ‘In the end we all succumb to the pull of the molten core’ was made with Newcastle and the Laing in mind. It is a painting that looks forward (the youth) and looks back (the old man), but they are one and the same, entangled in a complex game of sitting in the present. The heads could be trapped in religious ecstasy or they could be in outer space. You might think it beautiful or really rather ugly. In the end I don’t want it to illustrate any one idea – I am happiest if it just seems like a complicated arrangement of abstract lines. This new work will go on permanent display from 20 May 2017. In 2018, to coincide with The Great Exhibition of the North (a two-month exhibition, celebrating art, culture, and design hosted by Newcastle-Gateshead), the artist has agreed to curate a show of key pieces from the Laing’s collection alongside his own work. 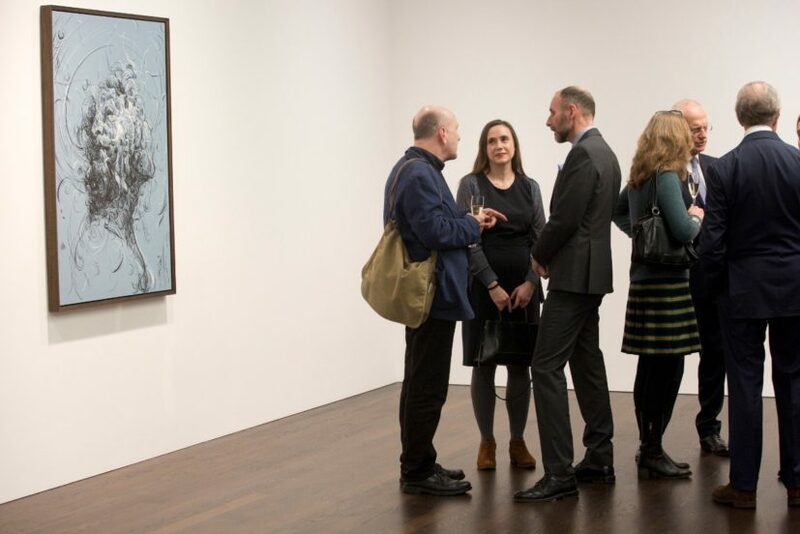 For over 100 years the Contemporary Arts Society has continually channelled philanthropic support of contemporary art to museums across the UK. In addition to landmark gifts to Tate, that included the first Picasso, Matisse, Anthony Caro and Damien Hirst to enter a UK public collection, the CAS has a track record of substantial support to regional museums, including the first work by Francis Bacon to Huddersfield in 1952, an installation by Olafur Eliasson to Eastbourne in 2003 and most recently a piece by Kader Attia for Middlesbrough Institute of Modern Art in 2016. The Laing Art Gallery has also received a number of significant gifts from the CAS since the organization was established in 1910, including works, amongst others, by Marlene Dumas, Duncan Grant, Peter Joseph, and Ben Nicholson. The Great Works Scheme is generously supported by the Sfumato Foundation.